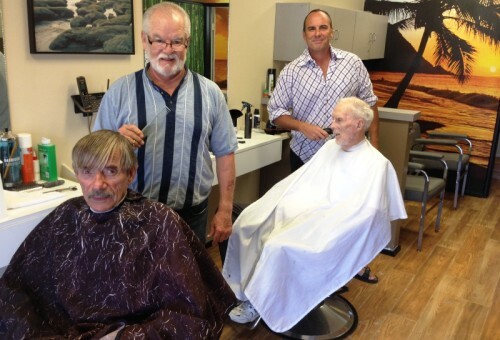 Ron Pilcher has been cutting hair for 40 years at Sunset Clipps in Ocean Beach. That all changes this week when he passes the torch to the next generation. It’s a veritable changing of the clipper guard, so to speak. It was a long journey to find who would take over the shop at the corner of Santa Monica and Sunset Cliffs. Enter Jason Bullard, 45, a trained stylist and longtime OBcean with big plans for the place. He says taking over the shop is a dream come true. Bullard said it wasn’t until about two years ago that he came in to check out the place. He says he and Pilcher hit it off immediately. The two made a gentleman’s agreement that when Pilcher was ready to sell the shop, his first call would be to Bullard. That day came a little over a year later … or so Bullard thought. Pilcher told him he was ready to sell, only to change his mind a little while later. But the time would come soon enough. Around February, Pilcher finally decided he was ready to call it quits. Bullard said that moment changed his life. He lost nearly 40 pounds and had a rejuvenated spring in his step. Pilcher’s career in cutting hair actually started long before taking over the shop on Santa Monica. Growing up in the Chicago suburb of Elgin, he came back from serving overseas with nothing to do. He started hanging out with a friend who worked at a shop in downtown Chicago. “He always had plenty of money and said he really enjoyed it,” Pilcher remembered. So he found himself in barber school, with dreams of fat pockets of his own. That dream took him to a Beverly Hills salon, cutting the hair of L.A.’s most fashionable. Next thing he knew, he was in San Diego, looking for his own shop. He found the spot in OB, bought a house in 1977, and the rest is history. Pilcher’s current clientele can succinctly be summed up as … well, pretty old. But also very loyal. It isn’t easy getting a spot in his barber’s chair, especially since he cut down his hours a few months back to just working mornings. These are guys who have known Pilcher for years. Much of their time spent in the chair is done while busting Pilcher’s chops. Bullard said he loves that atmosphere but would really like to make it a more inclusive place. He also has big plans for the shop itself, which could definitely use a makeover. Bullard, who has interior design experience, readily offers up his aesthetic vision for the shop. He wants to serve beers to those who want them. But he also wants to have Playstation systems set up for the kids (complete with headphones so they don’t bother the rest of us) and a more inviting waiting area. So, as Pilcher rides off into the sunset — he plans to move to Arizona this fall to a house he has built — Bullard’s time has finally come. We’ll see what he does with it. When I was a teenager, back in the dinosaur days, I used to have my hair cut at that shop, altho it was under different ownership back in the mid-Sixties. Spent many hours there as my mother insisted – for a while – that I have haircuts every 2 weeks or so. Then I grew up and stopped getting hair cuts. Timing of this story couldn’t be better! My friend who has cut my hair for the past 5 years just moved out of state. I’ve been dreading going to some other place. Wish I could just flowbee my head. But I think I’ll check these guys out. Love supporting local! Hey Jason, want to make this woman feel comfortable?? Please offer trims for women for a decent price. I would love to support some of the hair shops in OB, as I do love to shop local, but they are mostly out of my price range. I just can’t see paying $30 and more for a quick trim. Don’t know why they have to charge women so much more than men if it’s a simple long haired cut with some bangs. Other than that, Mazel Tov in your new venture!